Today was Christmas in every meaning of the word… well, excluding the fact that Christ was born in June or July….but that’s not the point. Today was Christmas. The past two days had eaten away at us, me especially. Dachary may have had that hard sugar crashy day, but last night I lay in bed lamenting the recent days. I was frustrated about our inability to just ride somewhere without constantly having to slow or stop for teeny towns and their topes, or the fact that you simply can’t go ten minutes down the road without encountering more people, topes, towns, hovels, topes, dogs, and more topes. Our hotel room last night had gone from having “character” to smelling like a cesspool, and as we were finishing packing the bikes I was wondering if maybe this whole adventure motorcycling through foreign countries thing wasn’t for me. Maybe I should have just done the Trans-America-Trail, or explore some of the Canadian wilderness in the summer. But I had forgotten the power of Christmas. We got to El Tajin around 9:30 after a quick trip to the ATM which we’d found while looking for food last night. We weren’t able to find food beforehand because, so far, it seems that Mexicans simply don’t open for business that early. But there is a minor sea of restaurants just outside the entrance to El Tajin and we went with the one whose waitress didn’t attack us with a menu before even getting our helmets off. El Tajin was spectacular. We have over 400 photos to go through. It was everything you hope an ancient ruin site to be, with the exception that you’re not allowed on any of the structures. 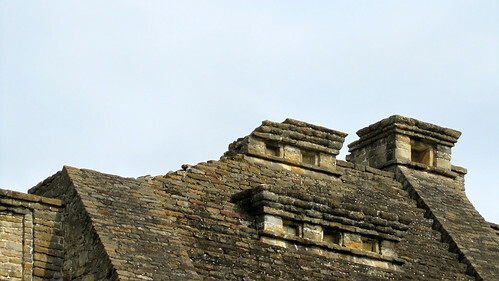 We really wish they’d erect a stairway up the side of one… somewhere that didn’t really affect the view of it, but would let you get a feel for what it was like up there. But we had a blast. Only note for future visitors is they don’t allow video cameras for some reason. So, we said “No. No bideo,” and casually didn’t open the side pockets of our tank bags with our helmet cams. We use the still camera for our video anyway, but still no point in dealing with going back to the bikes or coat-checking them or whatever. 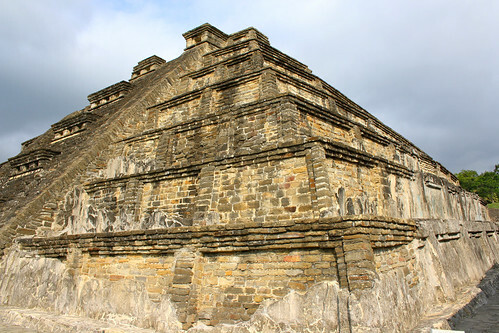 I’ve uploaded about 20 of the El Tajin Picture Set on Flickr so far and will add more as time and bandwidth allow, but here are some for your immediate gratification. We hit the road, and because we were generally just concerned with heading southeast, and not how, we went that way found ourselves on the best road yet. Miles and miles of riding. Almost no houses, almost no topes, hardly any towns… Eventually the skies started to darken and when the hills in front of us started getting hazy and white we pulled over at an unfinished work-site and put our rain liners in our pants behind the building (such a pain) and set out again. Approximately forty-eight seconds later we hit the rain. Having just donned our rain gear neither of us really wanted to get off and eat, but we knew we needed to soon. No more sugar-crashy Dacharys! So, after passing a number of people selling delicious smelling roast corn (and nothing else) we pulled in at the first place with carne (meat) on the sign. We haven’t had great luck with restaurant food so far, but this was pretty, and decent, but I didn’t find it particularly inspiring. However, when we pulled up the people there started to move the tables so that we could pull our bikes under the porch overhang. Being drenched already we waved them off and assured them it was ok.
We rode on, through a cute town and over the mountains gaining over 3000 feet in altitude through gorgeous curvy roads with beautiful misty sights. If only the curves weren’t all wet. But, we can’t carry our stuff back… hell, I’m not even sure where the hotel IS. “No worries. I’ll take you back. 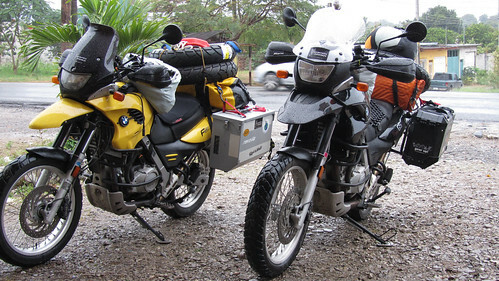 ” “Our panniers too?” “Sure sure.” (again, all in Spanish) Open, remove, Open remove. Unlatch Unlatch. He hauls each one to the truck as soon as we set them down. Then we climb into the tiny cab, find I need to practically sit *on* dachary for him to get it in reverse, then laugh, and giggle all the way back to the hotel. The guys carry the panniers in, we thank them, and we set off for food. “Oh look, a pastry shop. We should stop in before they close.” We grab a pizza pan and tongs and start picking tasty looking things when in comes a man and his two foot high daughter who stares at us in awe as we’re still in full gear because we’re already wet and it’s still misting and dripping out. “Hello.” I say to her. Her father, hearing Dachary and I chatting to each other, starts talking in English. I try “Hola” to her but she just stares. “She can’t even say hello.” He says with a smirk, and helps explain what one of the things I’ve picked up is, and then with the price. I seem to have a really hard time with any price that involves a 9. Basically, if I can’t understand the number I can be relatively certain there was a 9 in it somewhere. Alex leads us down a narrow alleyway that we would have missed entirely were we wandering around on our own. It leads into a maze of vendors stalls packed within a tiny space, and barely two feet between them to walk past. You must duck under some pinatas while going down some stairs; dodge around a rack of clothes protruding out into the aisles; weave past a display case that has been pushed too far out for the other to simply get into the tiny stall. Like everything else in Mexico, it was colorful and full of people; a mishmash of chaotic sights and sounds and smells; of people speaking Spanish and watching us gringos with curiosity as we venture into “their” place. It was a window onto another world we hadn’t seen yet in Mexico, and there’s nothing like it in the United States. And sadly, we had left our hotel without a camera. Things were closing for the day, so there wasn’t a chance to go back for pictures. Never leave the hotel without a camera! Alex leads us through a hallway sized alley, past butchers with hanging pig parts. To a place with tasty quesadillas that has run out of food. Then on through more teeny alleys to a place with half a pig’s head on a warming stove. There’s a cutting board made from a solid foot of tree trunk, with a curve in it that matches the blade of the knife that’s hacked away at it for years. He tells us to sit down at the short wooden stools, stands his daughter on the next one, and proceeds to help us order. Six little servings of two tiny tortillas, diced piggy, cilantro, red spoo, and something else. One plate each. Then, because he thought we might want more, and we showed interest, and suggested we’d eat anything, another plate of the same, only with piggy cabesa (head). He made sure we knew how much the total would be and took off. We had no cards with us to give him. We had no camera with us to take a picture of the delicious food, the wonderful alleys, or Alex, and his daughter Katherine. He spent two years working in New York, then came back to his family in this small town. Christmas, thy name is Alex. The piggy cabesa by the way? Unbelievably good. Awesome! Thanks for the t-shirt love! I have been following and am pumped for you guys. It looks like you are having a hell of an adventure! It’s definitely been a hell of a ride so far. 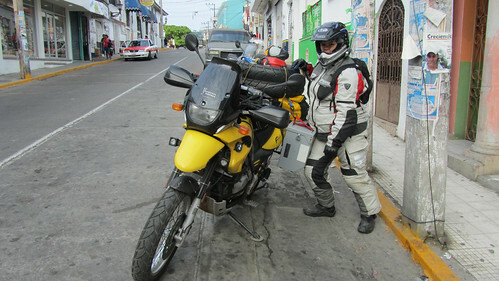 But the riding in Mexico has been great, so if you ever get time off, I’d recommend it! 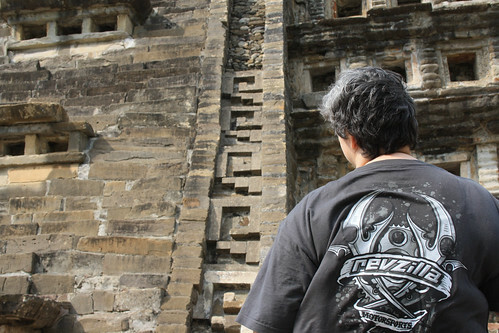 (And the RevZilla shirt is Kay’s favorite, now… he’s finding it a lot more comfortable than the Smart Wool for walking around. We wear them a ton, so thanks! 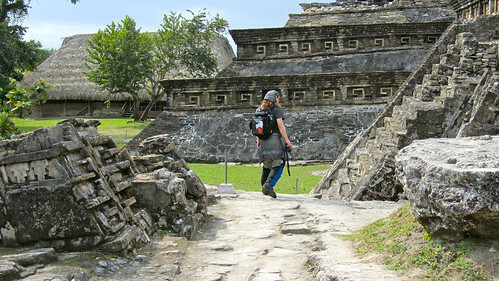 Sadly, it was a bit too nasty to wear at Palenque (because we wear them too much) or you’d have more t-shirt love… but there are plenty of ruins ahead!